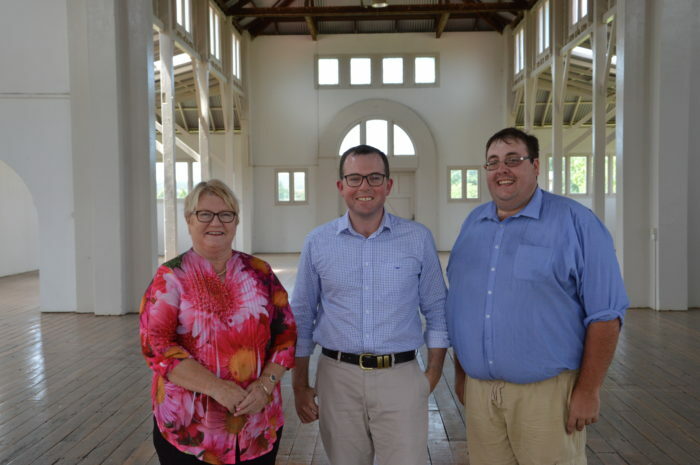 A STATE Government grant of $12,237, announced today by Northern Tablelands MP Adam Marshall, will allow the Armidale and New England Show Society to throw out some old and bring in new glass display cases to better show off its main pavilion exhibits. Mr Marshall said the funding, from the NSW Community Building Partnership Fund, would allow the Show Society to modernise the existing cases, cabinets and tables for the showground. “The grant will enable the society to replace some old display cases that don’t have wheels, that are very heavy and a danger to move around and are dilapidated and almost derelict,” Mr Marshall said. Show Society Secretary Narelle Pink said many of the old pavilion display tables were a relic of a bygone era in show exhibition terms. “They’re old and very rickety for putting flower and farm produce on, especially the tables for the flowers, they’re old hardwood types with little steps on top and so rickety and extremely heavy, so replacing them with more portable pieces will make life so much easier for everyone involved in the pavilion,” Mrs Pink said. Mr Marshall said the funding would provide for a modern move into a new era of exhibition space display – that also fitted with the Society’s general philosophy of moving with the times when it comes to keeping the show relevant and sustainable. “The Armidale and New England Show celebrates its 144th year next March 8 and 9 and the Society is increasing memberships and involvement from younger people. “That infusion of youth and new-found intelligence for connecting with more people is paying off. “They’ve now got young stewards and show committee members and they’re using social media and technological change to do that, to bump up entries in the past two years in categories like knitting and crochet. Mrs Pink said final negotiations were underway with the suppliers for the new equipment to fit the exact bill the Society wanted for the new display cases. They will be in place for next year’s show.